The Form Five student won herself a full tuition fee waiver for any pre-university programme at Sunway College, a cash prize of RM600, a Champion trophy, a certificate of commendation from the Oxford and Cambridge Society Malaysia and the Challenge trophy for her school. Margaret Hall, Chairperson of the 15th Oxford and Cambridge Society Malaysia English Language Event said Shameena’s presentation with good content and her understanding of the difference between intelligence and wisdom distinguished her from the other five finalists. Hall shared that the judges found all six finalists very calm and confident when they presented their stories on stage. Winners of the Oxford and Cambridge Society Malaysia 15th English Language Event: Public Speaking Competition 2017. Sravan Krsna Rao A/L Venikatasamra Rao of SMK Kota Kemuning, came in second while Kyle Boonwaat, also from SMK Kota Kemuning took the third place. Sravan Krsna took home RM10,000 tuition fee waiver for any pre-university programme at Sunway College and cash prize of RM400, while Kyle won RM8,000 tuition fee waiver for any pre-university programme at Sunway College and cash prize of RM200. Both also received a trophy and a certificate of commendation each. Winners of the consolation prizes were Abdullah B. Abd. Shukor of SMK Sultan Abdul Samad; Dhavin Kumar LaL Asokan of SMK Taman Connaught and Melanie Fernandez of SMK Puteri, Seremban. Each took home RM2,000 tuition fee waiver for any pre-university programme at Sunway College, a cash prize of RM100, individual trophy and a certificate. The panel of judges for the final comprised of Professor Abhi Veerakumarasivam, Chacko Vadaketh, and Sharifah Bakar Ali of the Oxford and Cambridge Society of Malaysia. Dr Elizabeth Lee, Senior Executive Director of Sunway Education Group and Sunway University hoped that the competition can help to reinforce language and critical thinking skills amongst high school students and at the same time sharpen their communication and articulation skills. 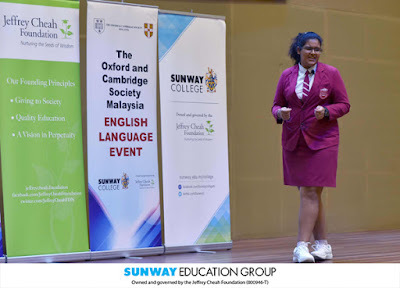 The competition organised by Sunway College together with the Oxford and Cambridge Society of Malaysia saw a crowd of approximately 800 students from Form Four and Form Five, accompanied by their teachers from 20 schools attending the event. Asides from the competition, guest speakers shared tips on effective writing and oral communication skills. Speakers for the day were Professor Abhi Veerakumarasivam, Chacko Vadaketh, and Danial Rahman, Press Secretary to Malaysia’s Minister of Higher Education.